Munich, 1940. The racing department at BMW had only one thing on its mind: the 1st Gran Premio Brescia delle Mille Miglia. Five cars from Munich were registered for the big race, but preparations were not exactly worry-free as time ran out to get the cars ready. However, as the BMWs crossed the finish line one by one in Brescia on April 28, they had achieved what few had dared to expect: overall victory, team victory, and third, fifth and sixth place in the rankings. That April day witnessed BMW’s greatest racing success so far on four wheels – and one which continues to define the character of the brand today. The 1940 Mille Miglia was the climax of a journey that had begun with the design and presentation of the BMW 328. The BMW 328 was not only one of the most beautiful sports cars of the prewar era, it was also the most successful sports car on the race tracks of Europe in the 1930s. A small brochure circulated among a select group of people in late 1935 revealed the existence of a new 2-litre sports car to be known as the “Typ 328”. The brochure was intended purely as an appetiser for “friends of the company”; there was no announcement in the press. Journalists were left open-mouthed when they set eyes on the car for the first time in the Nürburgring paddock on June 13, 1936. There, Ernst Henne was preparing to race the 328 in the International Eifel Race the following day. The motorcycle world record holder roared away from his rivals off the start line and soon left the rest of the field trailing in his wake with a phenomenal average speed of 101.5km/h. This show of strength from the 328 had commentators purring about the future of the German sports car. However, few could have guessed that they were witnessing the dawn of a new era; after all, by that point only three prototypes had been built. The second victory for the 328 arrived in August, with British BMW importer H.J. Aldington sweeping all before him in the Schleißheimer Dreiecksrennen race. Aldington then persuaded the powers-that-be at BMW to give the car another run outside Germany. The three prototypes duly made their way to Ireland for the Tourist Trophy sporting green Frazer-Nash-BMW livery – and cantered to a 1-2-3. The 328 had got the ball rolling and several more victories followed over the ensuing months. However, it was still the three pre-production cars taking it in turns to rack up the wins, with various drivers at the wheel. At the 1937 Eifel Race it was left to the nine BMW 328 racers on the grid to fight it out for victory. Over the years that followed only a handful of cowed attempts were made by other cars to take on the hot-heeled BMWs. These intrepid lone rangers were doomed to failure as the BMW 328 quickly took Germany’s race tracks by storm. 1937 had been a hugely successful year for BMW and its new sports car. The BMW 328 had run out of rivals in the 2-litre class in Germany, and it had also put itself on the radar of sports car drivers in other countries with a string of successes abroad, mostly with Ernst Henne at the wheel. Now BMW needed the big international breakthrough, a triumph on foreign soil that would make headlines far and wide. While central Europe remained firmly in winter’s grip, south of the Alps the motor sports community was priming itself for a race which had, over many years, become one of the most famous on the calendar: the Mille Miglia. On April 3, 1938 this legendary road race, starting for the 12th time from Brescia and leading through half of Italy, would send a whole nation into an unimaginable frenzy of enthusiasm. At the Munich racing department the engineers were hard at work, readying a brace of works cars for action. The race organisers had revised the class boundaries for the 1938 event. The national sports car class was joined by categories for international sports cars with and without a supercharger. Of the 155 drivers entered for the race, 119 lined up in the national class, highlighting the Mille Miglia’s status as first and foremost an Italian national event. The smallest class in which international drivers could compete was therefore the two-litre sports car class. In 1938 the organisers set out to encourage more foreign, i.e. German, drivers to take part. However, only four drivers responded to the appeal, all entering BMW 328 racers. The NSKK (National Socialist Motoring Corps) registered Prince Max zu Schaumburg-Lippe as its driver and – as a manifestation of the German-Italian friendship – the experienced Mille Miglia campaigner Count Giovanni Lurani as co-driver. BMW sent two works cars to the race, one manned by privateer drivers Uli Richter and Dr Fritz Werneck, the other piloted by Britain’s A.F.P. Fane with William James alongside as his mechanic and navigator. These three cars made up a team managed by Ernst Loof, head of the BMW racing department, and they were joined by the privately-entered driver/mechanic pairing of Heinrich Graf von der Mühle-Eckart and Theodor Holzschuh, an employee at the BMW sports car repairs department. Also on the start list were a Fiat, a Riley and an Aston Martin. The centre of Brescia was alive with anticipation over the night from 2–3 April. Thousands of excited onlookers had gathered at the start and lined the roads leading into the city to witness the unfolding of this extraordinary event. At 2.00 a.m. the first cars in the smallest-capacity section of the national class were waved on their way. The cars started at 30-second or one-minute intervals, according to the class. The long list of entrants meant that the first test for the drivers of the larger cars was one of patience. At least they could relax in the knowledge that they would be driving in daylight, although that also meant they would have a lot of overtaking to do. By contrast, darkness had yet to yield when the cars in the 2-litre class were called to the starting line. Prince Schaumburg was the first to set off into the Italian night, on the stroke of 4.30 a.m., followed by Uli Richter, the three non-BMW cars, Fane and von der Mühle-Eckart. The BMW racers wasted no time in setting a withering pace, showing enviable confidence in the durability of their beautifully prepared race engines. By the time they reached Rome they had already seen off the challenge of two of the other manufacturers in their category, and the third was forced to retire shortly afterwards. But the BMWs were not about to slow down to celebrate. Quite the opposite, in fact. With their class rivals out of the picture, they were free to launch an attack on the more powerful cars. The Germans were driving with clockwork precision, and only a few minutes separated them at any one time. The fastest drivers arrived back in Brescia in the late afternoon. Less than 12 hours after crossing the start line, the powerful supercharged Alfa Romeos, the Delahayes and the Talbots were back at base, as expected. The big surprise, though, was still to come; Fane steered his BMW 328 to eighth place in the overall classification, winning the 2-litre class and leaving a considerable number of supercharged cars in his wake in the process. Fane’s fellow-BMW 328s followed him home in 10th, 11th and 12th overall, securing 2nd, 3rd and 4th places in their class and rounding off a spectacular race for BMW. Added to which, they also won the team prize for consistency and the award for the best foreign entrant. BMW’s pride in claiming the biggest win in the company’s history was obvious. The 328 had proved that it was capable of sustaining incredibly high speeds over long distances without complaint. For BMW this success represented the international breakthrough in European motor sport. For the engineers in Munich, however, this was no reason to rest on their laurels. Tests had shown that an enclosed saloon, despite its larger cross-sectional area, could outperform an open sports car using airflow optimisation measures. Convincing performances in the Le Mans 24-hour race in 1937 and 1938 allowed the Frankfurt-based firm Adler, who introduced the first “racing saloons” to competitive action, to demonstrate clearly how streamlined bodies could balance out a deficit in engine power. BMW had been investigating this area of car development at the same time, but it was Professor Wunibald Kamm, head of the Research Institute of Automotive Engineering and Vehicle Engines at the Technische Hochschule Stuttgart (FKFS), who conducted the first wind tunnel tests with BMW models. The BMW engineers were now working under considerable pressure. As a celebration of the Berlin-Rome Axis, the German and Italian racing authorities had decided to organise a high-speed race in October 1938 on the newly built motorways between the two capitals of fascism. For BMW and the other manufacturers involved, this meant developing a high-performance sports car in double-quick time, one which could not only hold its own in race competition, but also had a realistic chance of overall victory. Guided squarely by the principles of lightweight design, Rudolf Flemming, who had played a major role in the design of the 328, designed an intricate space frame for the 328 chassis and covered it in a thin aluminium skin. However, the car known internally as Project AM 1007 was far from convincing. The Eisenach-built body fell short of the mark in terms of workmanship, and the car’s handling left a great deal to be desired. A huge amount of development work was still required to turn this into a racing car worthy of the name. The efforts of BMW to get a fast car up and running had not gone unnoticed outside the company. Back in the spring of 1938 the NSKK had founded its own racing operation, a self-styled German national team for sports car racing. Its aim was to fly the German flag at events abroad with its own trio of BMW 328 racing cars. The BMW factory had a contractual obligation to keep the NSKK cars up to the latest stage of development, but its new racing saloon represented a potential rival to the NSKK team – one that had to be taken seriously. Under no circumstances could a works driver be allowed to jeopardise the victory the NSKK team had set its sights on. However, when Prince Max zu Schaumburg-Lippe, the team’s leading driver, demanded he also be given a racing saloon, BMW responded that they had no spare capacity to built one. Schaumburg-Lippe was therefore left with no other option than to shop around among his allies. Germany’s good relations with Italy helped to prompt an offer from Carrozzeria Touring to produce a streamlined body. The Milan-based coachbuilder was already working on a similar project for Alfa Romeo and could call on previous experience for the job, having built a body of the same type a year previously. This streamlined construction in patented superleggera form could be adapted to the standard 328 chassis with no great trouble, and the Italian craftsmen came up with the finished article in just four weeks. The Coupé weighed in at just 780kg and looked resplendent in German racing white, but it was far more than just a pretty face. Test runs had shown that it was capable of exceeding the 200km/h mark – and holding a relatively straight line in the process. The Touring Coupé lined up for its debut race at Le Mans on June 17, 1939 with Prince Schaumburg and BMW engineer Hans Wencher entrusted with the driving duties. After 24 hours and 3,188km, the pairing emerged triumphant in the 2-litre class with a sensational average speed of 132.8 km/h. The success of the “Cinderella” Touring Coupé was greeted with mixed feelings at BMW. However, the engineers at the development department had not been idle themselves. Extensive wind tunnel testing had revealed that the Project AM 1007 streamlined body did not fit the chassis. The newly formed “Künstlerische Gestaltung” design department headed by Wilhelm Meyerhuber was therefore asked to draw up a new streamlined body. Under project number AM 1008 the design department improved the car’s straightline stability by extending the chassis by 20cm. The newly developed space frame, made from Elektron, weighed just 30kg. Taken as a whole with the aluminium outer skin, this meant BMW now also had a “superlight” body in its arsenal. The Kamm Coupé was significantly larger than the comparable Touring variant, but a rigorous adherence to lightweight design principles meant it was also 20kg lighter. The investment of time and effort was to pay dividends. Spring 1940. In Italy all attentions are focused on bringing the Mille Miglia back to life. The legendary race had last been run over the historic course in 1938. However, after a rash of accidents it had been temporarily suspended. Now, two years later, the Mille Miglia was back in business, but the original route had been dropped in favour of a 167km triangular course between Brescia, Cremona and Mantua. The drivers would complete nine laps of the new circuit, a move warmly welcomed by the watching pubic, who only saw the cars fly by once when the race followed its original route. In a nod to tradition, the race was once again billed the 1st Gran Premio Brescia delle Mille Miglia. In the final three days before the race the drivers gathered with their cars for technical inspection at the Piazza della Vittoria in the centre of Brescia. Among them were the five German BMWs with their silver paintwork. The starting field was dominated in traditional fashion by the red cars of the local contenders. A total of 70 Italian driver teams would line up for the race in FIATs, Lancias and Alfa Romeos. They would be joined by two blue cars from French manufacturer Delage, also with Italian drivers at the wheel. The two Coupés, meanwhile, were entered by the ONS (the highest-ranking national sports authority in Germany at the time). Fritz Huschke von Hanstein and Walter Bäumer would drive the Touring Coupé, while two outstanding Italian drivers – Count Giovanni Lurani Cernuschi and Franco Cortese – had been recruited to pilot the works Kamm Coupé. While the target for these two Coupés was overall victory, tradition suggested that the Alfa Romeo team was a far more likely winner. April 28, 4.00a.m. The cars are sent on their way at one-minute intervals. Von Hanstein/Bäumer – in the first BMW – entered the fray at 6.40a.m., followed by their team-mates and the Italian drivers in the largest-capacity class. The youngster von Hanstein set out his stall from the off, covering the first lap at a speed nobody present had thought possible. Already, the gap between the BMW driver and his closest pursuer in a Delage was one and a half minutes. 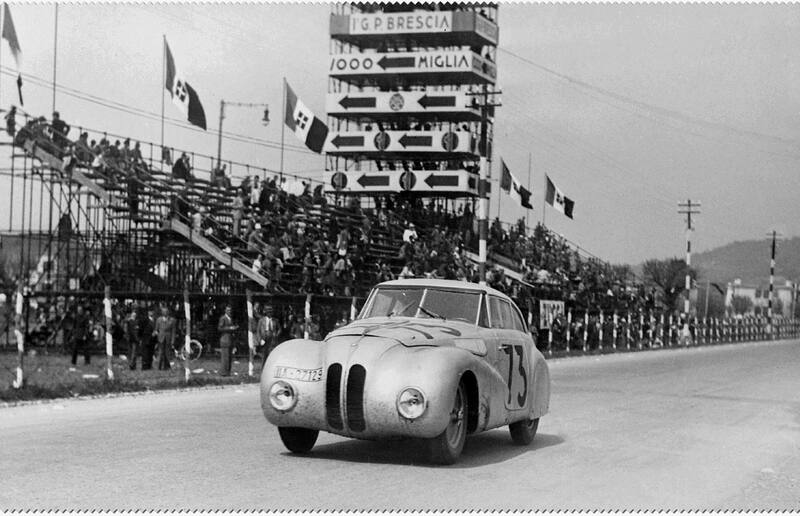 Lurani/Cortese, meanwhile, were lying third in the second BMW Coupé, followed by one of the highly fancied Alfa Romeos. The three Roadsters were biding their time in seventh, eighth and ninth positions. On the second lap the two BMW Coupés led the way, with the Italians locked in a battle with the charging streamlined Roadsters. However, the Kamm Coupé could not keep up such a breakneck pace for long. It was hit by problems first with the carburettor, then with the oil supply, and on lap seven the hugely disappointed driver pairing were forced to retire from the race. The Touring Coupé, meanwhile, was continuing to reel off the fast laps undeterred. Indeed, von Hanstein set the fastest time ever recorded in a sports car race with an average speed of 174km/h. However, there was the odd difference of opinion between von Hanstein and his co-driver Bäumer, as the ambitious baron was determined to win the race and ignored the pre-arranged driver changeover. In the end, Bäumer had to be persuaded to settle for the role of co-driver in order to make sure of the win. The Coupé was gradually building up an unassailable advantage over the chasing pack, though, and the two men finally swapped seats a few kilometres from the finish. In the end, it was Walter Bäumer who had the privilege of driving the Touring Coupé across the line to claim overall victory. Unsurprisingly, celebrations were decidedly muted among the Italian crowd. Instead, the packed stands were immersed in a collective sense of bewilderment. What had happened to the red cars? Over 15 minutes passed before the Alfa Romeo of Farina/Mambelli came home in second place, followed by Brudes/Roese in third, Biondetti/Stefani in fourth, Briem/Richter in fifth and Wencher/Scholz in sixth place. BMW had topped both the team and overall standings, and great shows of excitement awaited the crew on their return to Munich. Odeonsplatz and the Residenz (Royal Palace) provided an impressive setting in which to display the winning car to the people of Munich.